CHESHIRE – Suzanne Goudreau, a town resident, is a talented artist with whatever medium she is using. She has worked in acrylics and oils and painted posters for the Pittsfield July 4th Parade for seven years. 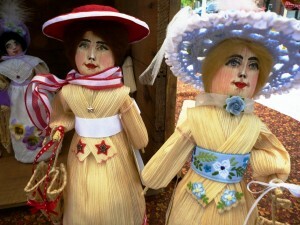 These days, her artistic touch has switched from canvas to corn husks.She creates fashionable lady dolls out of them. 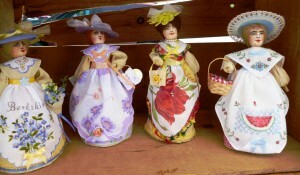 Looking at the darling outfits the dolls wear as well as their bonnets and accompanying purses, one could surmise their creator also has a touch of fashion designer in her. 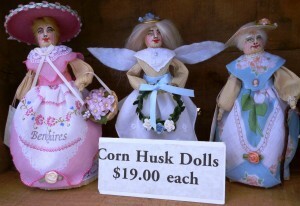 This summer she is selling her corn husk dolls at the newly introduced pilot Adams Farmers Market held every Sunday. For example, one lady bought one for her granddaughter who is going away to college. Another woman has a granddaughter who loves fairies and bought a doll with that theme. The craft is new to her. 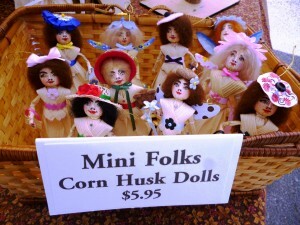 She read a book on corn husk dolls and decided to give them a try. 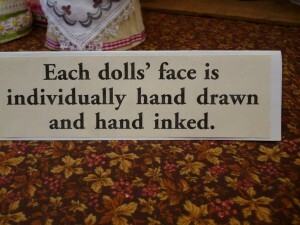 Because of Ms. Goudreau’sartistic talent, each doll has a hand-painted face. She declines doing commission work. 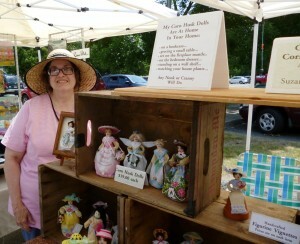 Besides the farmers market, she sells at shows and craft fairs. She can also be contacted by email atsuegoudreau@roadrunner.com. Ms. Goudreau works on her dolls in a room she calls her studio.She makes the dolls in stages. Each is about seven inches tall. 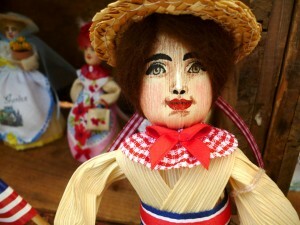 Sure enough, she made a doll all dressed in a lavender lilac-covered handkerchief outfit. 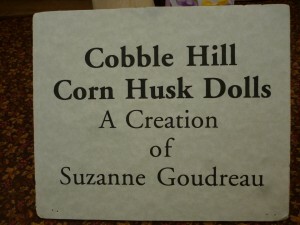 The name of her doll business is Cobble Hill Corn Husk Dolls. She plans to continue making the dolls for now. 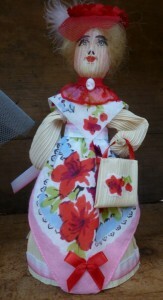 In addition to her corn husk dolls, Ms. Goudreau has also been bringing some of her jewelry pieces to the market. They are another medium that lets her artistic talent shine through. She’s also been making glass pendants. “There’s nothing else like them, really,” she said. She sculpts objects, such as a tiny, one-inch tall vase filled with dried flowers, cameos and miniscule books, and places hollow glass domes over them. They look like old-fashioned concave photo frames but in miniature! Ms. Goudreau said she has thoroughly enjoyed participating in the new Adams Sunday Farmers Market.